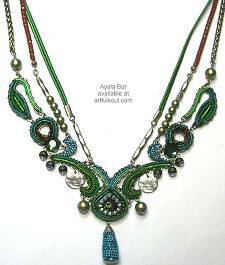 This page, and the links to follow, show Ayala Bar NECKLACES ONLY, gathered from all color collections, all seasons. They are arranged BY PRICE, so click to beginning or end pages accordingly! If you are looking for coordinated sets, please use the links to color collections. 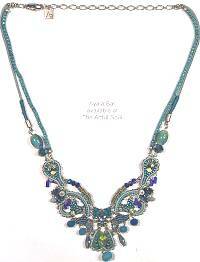 We offer necklaces by the following designers...so check them out! 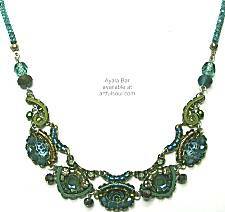 See also our Necklace Theme Page that includes samples from many designers, including those above! And finally, there is our Outlet Store Necklace selection! Garden fresh colors are popped by the cobalt blue accents. Multicolor prints under glass in various shapes mix together nicely, joined by multiple jump rings, anchored by large crystals at each end plus a few danglers. Insight Collection is dominated by cobalt blue in this multicolor garden theme that includes hints of red, yellow, orange and green, metallic coils and prints under glass with dangling blue crystals beads. Not all colors appear in every item. Beads strung along the top join a steel chain working to back, navy blue mesh chain extends from the mosaic strand at front, everything joined at center to mosaic pieces. Crystals and glass, a single multicolor print under glass..
Ornate curving shapes with prints and crystals at their centers, framed by beads and chain, delight in an organic motif that has shell disk drop with crystal under bead cap dangling on top of it. Joined to silver mesh chain that flexes like a ribbon to the back. Bold and fresh use of fabrics. Cords and metal coils filling in the spaces of shapely metal backgrounds. Handmade fabric bead dangling down the center. Metal disks, a little bit of crystal sparkle, pieces joined to a trio of chains toward the back in cranberry mesh, green cord, ornate silvertone chain. Lots going on here in an asymmetrical design that fills the front with wondrous color within the delicate mosaic shapes. Everything stays in place with multiple jump rings. Curves of color metal coil, tiny glass and crystal beads, prints under glass, there is a good amount of sparkle. 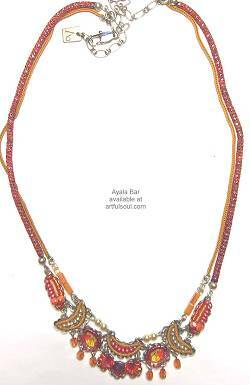 Center motif joins to 4 strands to the back, both beaded and metal chain, altogether about 1/2 inch thick.